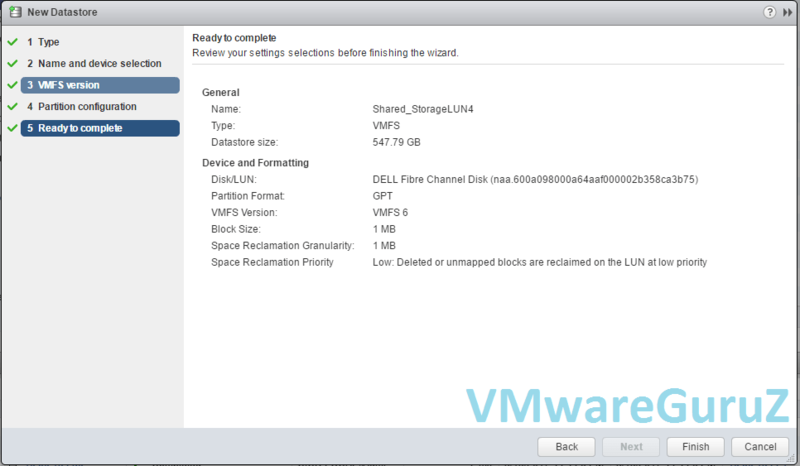 Question: Can you explain the options that you see when you format new Data store in vSphere 6.5 via Web client? Answer: vSphere 6.5 released some time ago and Interview panel members now started asking for questions related to 6.5 like differences and what’s new in 6.5. Today let me help you to understand the Storage part. 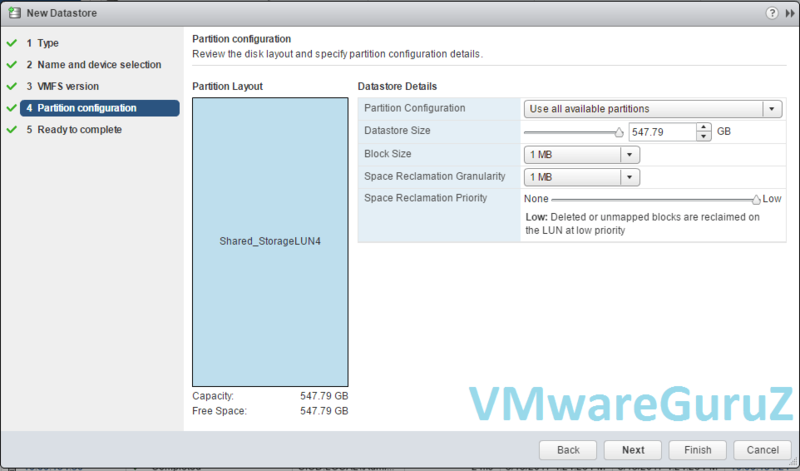 In real-time, there are couple of scenarios like new VM’s build project, migrating to new Storage Array, Increasing current VM disk file size requires additional storage in VMware Cluster. VMware administrator is responsible to make sure that he/she understand the over-commit challenges with Data store. For example if we have 2 TB of Data store and you already allocated 1.8 TB of space, which means you consider the thin disk vs thick disk precaution before assigning the leftover 200 GB storage space. 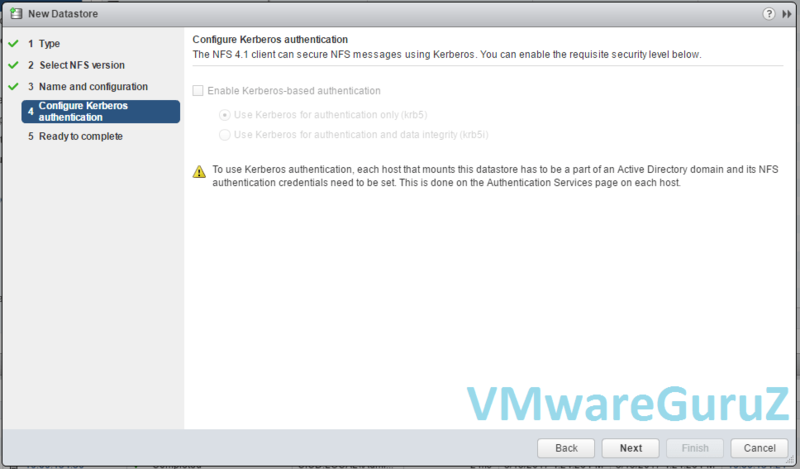 To keep it simple – thumb rule for VMware administrator is not to allocate more space than available in the Data store for Production Infrastructure. Also you need to understand the performance challenges with THIN on THIN vs THICK on THICK options selected by Storage and VMware Administrators. 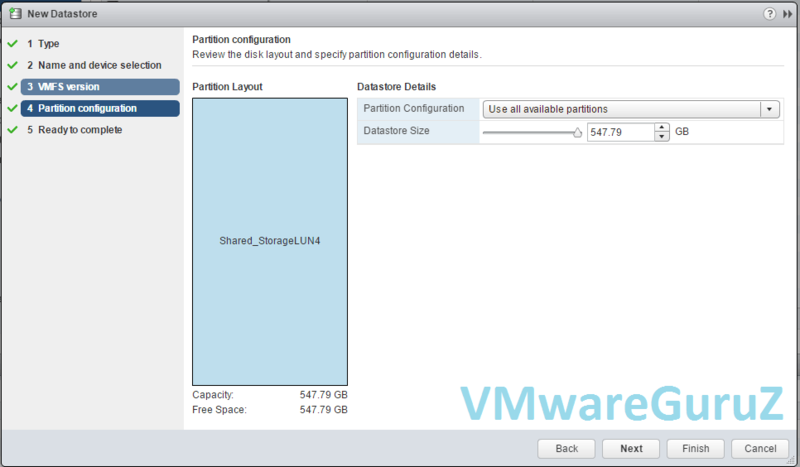 Do not forget Storage administrator also can create THIN disks to allocate the storage for VMware Cluster. 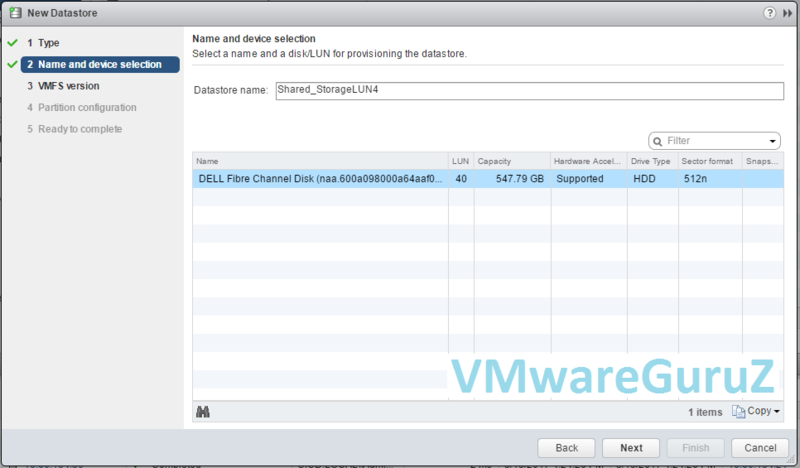 Let’s talk more options available while you format the Data store at VMware cluster, after Storage administrator confirmed that LUN allocation to all ESXi servers. 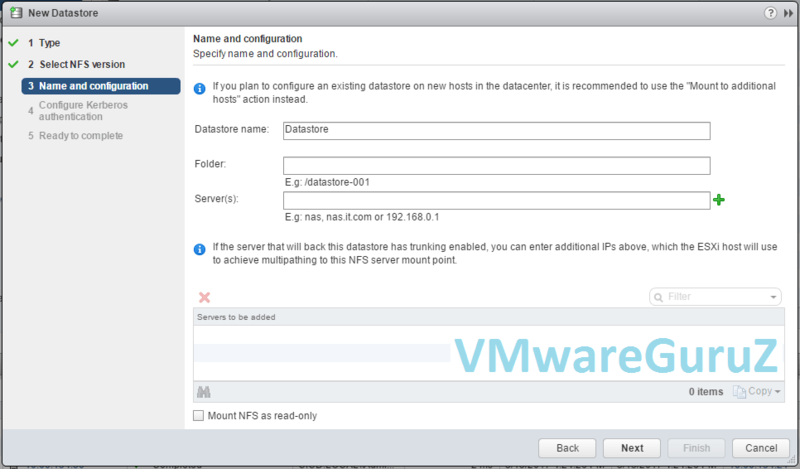 First we will see the standard steps performed by VMware Administrator for VMFS type LUN which has options to format with version 5 or 6 followed by NFS & VVOL based storage. 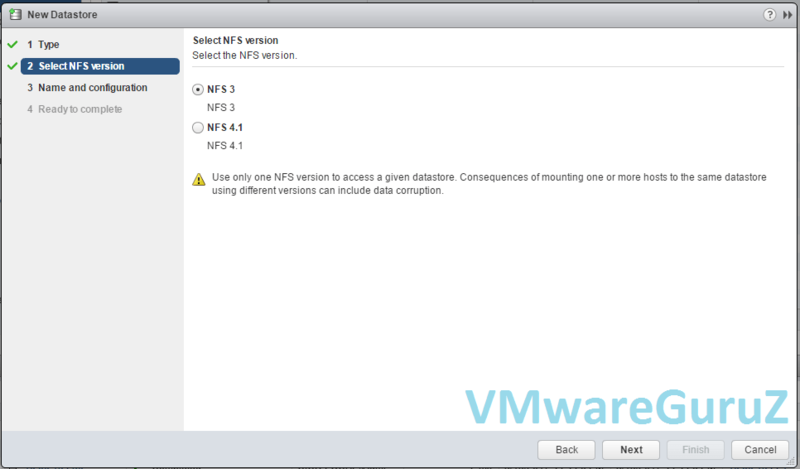 You can find the differences between these version in my previous post “VMFS 5 vs VMFS 6“. Previous versions won’t show VVol option and Interviewer expectation is that you will highlight that point and describe it’s functionality. 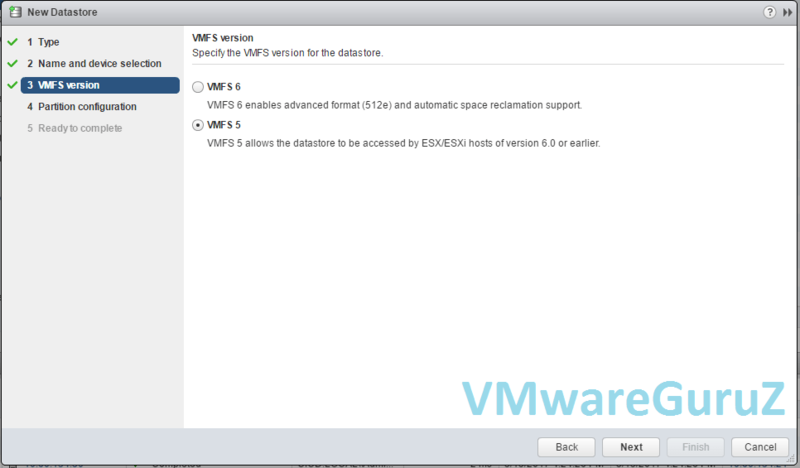 VMFS 6 enables advanced format (512e) and automatic space reclamation support. You can mention the options – Space Reclamation Priority and Granularity which are not available in previous versions. You can also mention NFS versions 3 & 4.1 which makes your answer in real time format. Interviewer is keen about new options available or enabled with vSphere 6.5 and make sure you mention all these in your answer to make better impression. If you are new to VVOL term, here is the quick explanation about it. Virtual Volumes (VVols) is a new integration and management framework that virtualizes SAN/NAS arrays, enabling a more efficient operational model that is optimized for virtualized environments and centered on the application instead of the infrastructure. Virtual Volumes simplifies operations through policy-driven automation that enables more agile storage consumption for virtual machines and dynamic adjustments in real time, when they are needed. It simplifies the delivery of storage service levels to individual applications by providing finer control of hardware resources and native array-based data services that can be instantiated with virtual machine granularity. 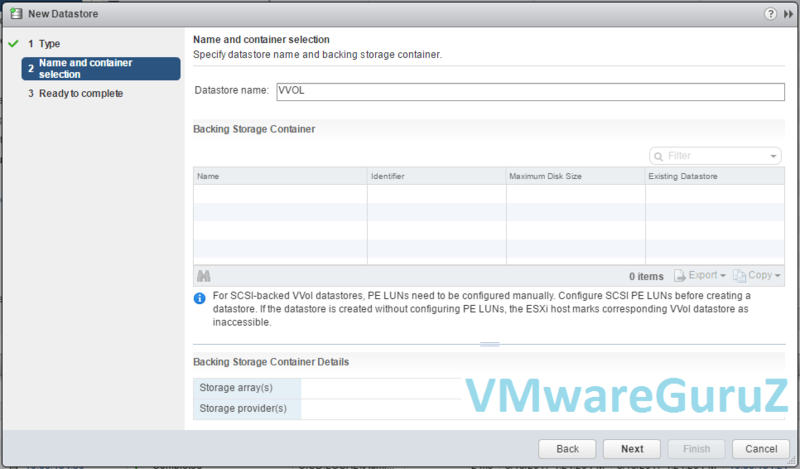 With Virtual Volumes (VVols), VMware offers a new paradigm in which an individual virtual machine and its disks, rather than a LUN, becomes a unit of storage management for a storage system.Virtual volumes encapsulate virtual disks and other virtual machine files, and natively store the files on the storage system.